Five pages into The Ghost Fleet #7, a big rig is driven out of a crashing aircraft, soaring feet above the ground as the force of the exploding plane sends it flying directly toward the reader. It’s a jaw-dropping two-page splash that is a perfect example of the vehicular-based action that has made this book so exhilarating, but that huge moment is just a small taste of what this miniseries’ creative team has in store for the penultimate issue. The cargo inside that all-important big rig is finally revealed in this chapter, and it introduces a fantasy horror element that takes the action to another level of hyper-dynamic intensity as supernaturally powered opponents go to war in the desert. One-eyed hero Trace Morales was already an incredibly formidable fighter before being possessed by the last surviving horseman of the apocalypse, but once he unleashes Death from the back of that truck, he’s all but unstoppable. Writer Donny Cates has kept this miniseries moving at a brisk pace throughout, but the momentum accelerates dramatically as he dedicates this entire issue to a thrilling showdown in the desert. Cates sets the stage for the action, but artist Daniel Warren Johnson and colorist Lauren Affe are the people responsible for visually interpreting it, and Cates does not make their job easy. Vehicular action is an especially difficult thing to portray on the page because so much of it relies on speed, and vehicles don’t have the malleable bodies that make the illusion of motion easier to achieve with living beings. It’s difficult, but it’s certainly not impossible, and a big part of creating vehicular speed on the page comes from incorporating other details that trace a path of motion. In this issue, that means using the terrain to indicate the speed with big clouds of sand that are swept up in the big rig’s wake. The Ghost Fleet has established Johnson as a major artist to watch, and this is a career-making issue that showcases his intricately detailed, textured linework, sharp eye for quick, powerful action, and versatility with character expression and design. It’s an issue that should have editors climbing over each other to have Johnson working for them, because it proves he can do it all. The book opens with a conversation that shows the energy Johnson brings to talking heads, starting the chapter on a quieter, more personal note before the scope of the story expands and pushes Johnson into a heightened mode of storytelling. 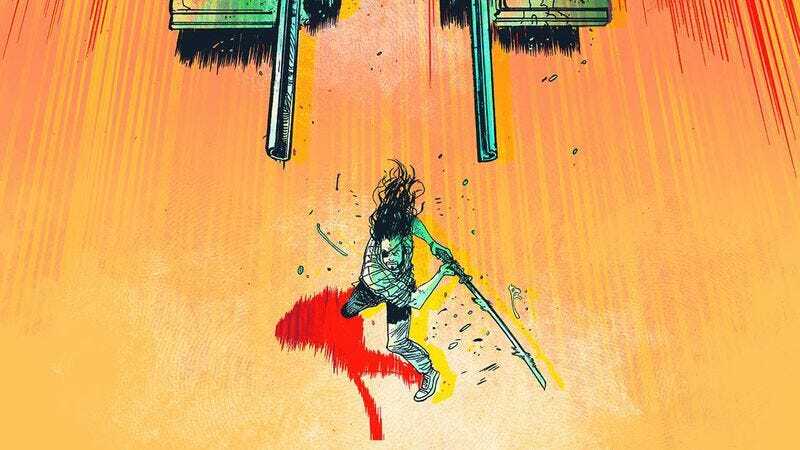 The action in the first six issues of The Ghost Fleet is impressive, but none of that compares to the power of this issue’s final four pages, which unleash a newly possessed Trace on a small army of tanks and heavily armed soldiers. Just how fast is this new Trace? He can slice through an entire group of men in the time it takes them to tell each other to attack. Johnson’s layouts for this big fight emphasize that Trace is no longer a man, but a force of nature with the capability to end the world, and this new state of being for Trace allows Johnson to go wild with his action staging. Trace can rip men apart with his bare hands and send tanks flying through the air with a single punch, and Johnson clearly delights in capturing all this carnage in breathtaking detail. Each beat of the fight is amplified by Affe’s coloring, which alternates between warm and cold tones to create extra tension on the page, and embracing a more figurative palette has added a lot of style to the artwork. Affe isn’t aiming for realism, and she brings a wide spectrum of colors to a story that could very easily be told with a less eclectic palette. A nighttime battle in the desert wouldn’t typically be a place to find bright pinks, greens, and purples, but each color brings its own distinct mood and interacts differently with the shades around it, opening up more storytelling opportunities for Affe. The Ghost Fleet is full of bombastic action, but it’s also a very human story about love, friendship, and loss. The first issue focused on Trace’s relationship with his old partner Ward, creating a strong bond that made it all the more shocking when Ward betrayed Trace by putting a bullet in his head. Later issues further explored the dynamic between the two men and made Ward’s wife, Sarah—who had cancer—a bigger part of the narrative, revealing how Trace’s love for the woman he could never have motivates him, even after she’s died. Gradually introducing this information kept the story grounded in emotion, and this issue delivers a lot of payoff for those more personal plot elements. Unfortunately, the payoff is all tragic. Ward redeems himself for his past deception by saving Trace’s life, but he does that by sacrificing his own (unless he somehow survived getting hit by multiple missiles). And the Trace and Sarah resolution is even more depressing. The horseman has been luring Trace to it with visions of Sarah, convincing Trace that he’ll be reunited with Ward’s wife if he accesses the truck’s cargo, but Trace doesn’t find a woman when he finally discovers what’s inside the truck. Instead, he finds an enormous nightmarish monster, a reveal that is given extra impact with a vertically oriented double-page splash. Johnson’s talent for unsettling creature design is highlighted by the grotesque being, and Affe’s sickly green color palette adds a putrid quality to the image that makes it especially gross. Launching a new property is always going to be hard, and The Ghost Fleet has been fighting an uphill battle that’s only gotten steeper. In February, Dark Horse announced that a number of its new series, including The Ghost Fleet, would abruptly end their print runs and conclude their stories with digital single issues before the release of expedited print collections (volumes one and two of The Ghost Fleet will be released in June and August, respectively), a move that has surely proven disastrous for single-issue sales. It’s not possible to gauge how this decision affected sales because digital numbers aren’t released to the public. But there are still a lot of readers that don’t read comics digitally, so they disappear when the book disappears off the racks. Even with an attractive price of $1.99 for digital issues, if readers are averse to the digital medium, then the series won’t end up in their hands. The bigger issue is that Dark Horse Comics aren’t available through Comixology, which severely lowers the publisher’s profile for many digital comics readers. Dark Horse titles are only available digitally through its website or the Dark Horse Comics app, but if the publisher is going to put more focus on digital comics, it should be doing everything it can to make sure those books reach the largest audience possible. Dark Horse has invested a lot of time and money into developing its app, but is having complete control over digital distribution worth it if it limits a book’s potential audience? Ease of access is a big concern with media consumers nowadays, and putting Dark Horse titles on the world’s largest digital comics marketplace would make finding them a lot simpler. Right now, readers have to take a few extra steps to get their hands on The Ghost Fleet, but the small inconvenience reaps major rewards.